Social Media Overlap, a photo by Intersection Consulting on Flickr. Olympics athletes are being restricted from social media during the Olympics but is this just another demand as a sponsored athlete? 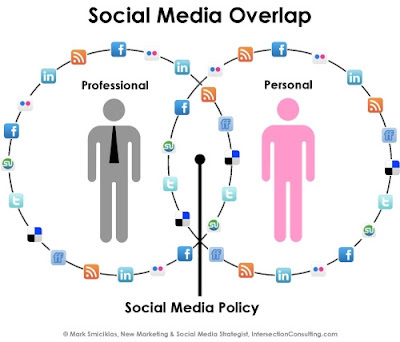 Olympic giants LOCOG have teamed up with social media site Twitter to implement social media restrictions in attempt to combat ambush marketing. These preventative methods appeared in light of sports brand Nike utilising hash tag campaigns and Olympic stars in a new promotional campaign. Digesting official IOC documentation it is clear to see that the guidelines laid out are highly regimented and aren't in place to protect the athlete but the official Olympic sponsors and the Olympic image. In the history of Twitter and Athletes cases the monitoring implemented by the IOC has been used forcefully. In the case of Australian swimmer Stephanie Rice her postings on Twitter had detrimental consequences on her career. This resulted in this athlete losing her sponsors and has not competed on an Olympic level since. "So how does this affect an athlete who may have a personal contract to report or write about what they personally see and do at the Olympics?" What it comes down to is the power of major Olympic companies, sponsors and social media. Olympic athletes have to conform to strict guidelines just to be able to compete, even though these guidelines are completely beneficial to the individuals behind the games. 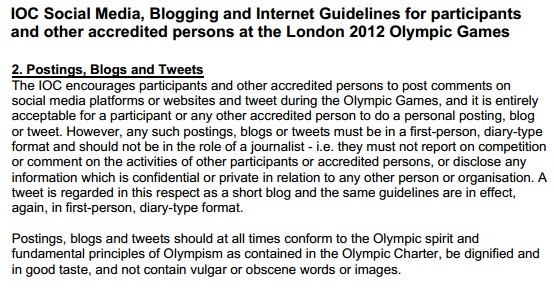 As restrictions get tighter and more and more online communities such as StarDestroyer are engaging with these rules the Olympic image is being tainted.